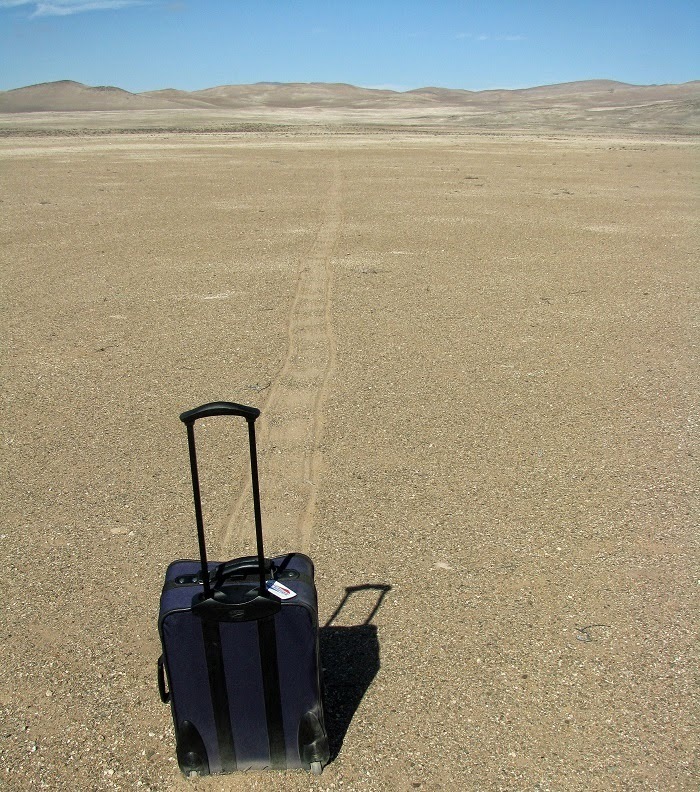 Nearing the end of the long haul from Baltimore to the Atacama Desert. The 7 1/2 hour overnight flight from Miami to Santiago, Chile went well enough, as red-eye flights go. In other words, it was pure torture. The attendants started serving breakfast at 3AM, which is 5AM Chile time. Yes, by an unexpected quirk of geography, the west coast of South America is two time zones east of the east coast of the US, at least when it's summer down there. We arrived at the gate in Santiago at 6:20, just before sunrise. It was a warm, clear morning. The first step out of the plane was to pay a $113 visa fee to get into the country--the guy said it was good for the life of my passport--sort of an incentive to come back to Chile in that strange sense of “saving money” by spending a lot (for airline tickets and the rest). I don’t know why I constantly fall for that stupid psychology. Anyhow, the next step was to go through immigration, then customs. I got my first taste of the aggressive mongering when a guy insisted on helping me from Customs Inspection to the domestic flight check-in area then asked for a tip. He was a real help, so I had no problem giving him a few dollars. 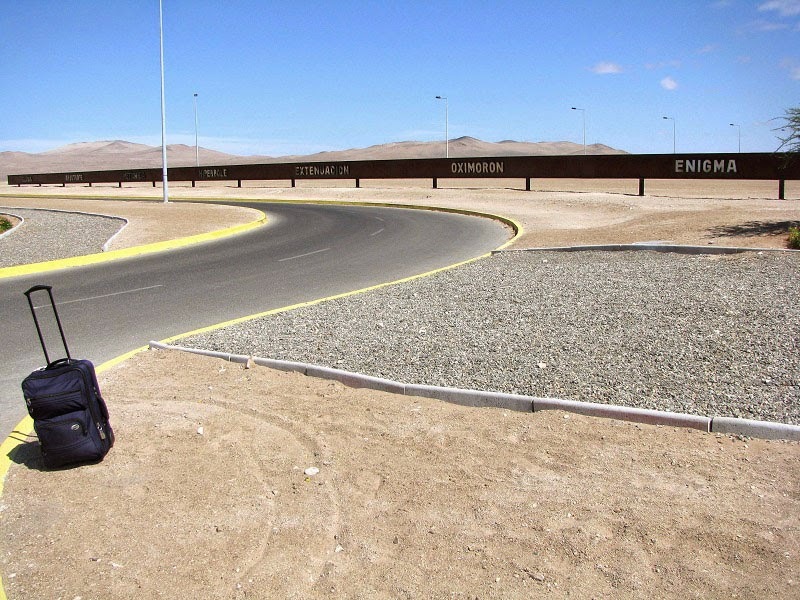 There was a grueling wait in a long line to check my bags for the last leg of my trip--a domestic flight from Santiago back north to the Desierto de Atacama airport. But I had the time to kill. I finished with the necessities at about 8:30, leaving roughly five hours before boarding. 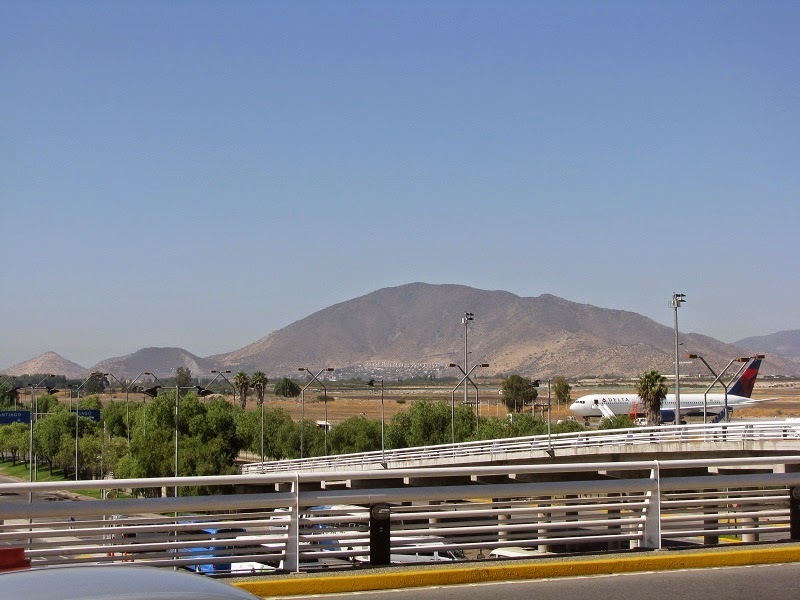 I wandered around the airport for an hour getting my bearings and deciding whether to go into downtown Santiago or to just stay at the airport. In the end I chose the 'old fuddy-duddy' option, missing some potential excitement, maybe, but as it turned out (read on) it was the best thing that could have happened to me. I rambled around the airport. When I wandered out to the passenger pick-up area I was besieged by hard-pushing taxi and shuttle services hovering at the arrival gates like vultures. At least five people tried to be my best buddy in just one pass of the several arrival exit gates as I toured around the airport. It reminded me of the predatory kids outside the tourist attractions at Cusco, Peru when I was there three years earlier--a nearly overwhelming barrage of in-your-face hard-sell. I think that helped push me toward the more relaxing option of just chilling at the airport. I had a few chores to occupy the time, but I could not find a store that sold sun screen and then I could not find a place that did currency exchange anywhere in the airport (was I missing something obvious, regarding the money changing?) Finally I retreated to a quiet corner sidewalk outside in the warm morning with a nice view of the rugged dry hills to the southwest. I sat there and enjoyed a few quiet minutes, got out the laptop and, using batteries, I caught up on my journal. I tried two different wifi networks but couldn’t figure out how to connect--neither one seemed to be willing to take an on-line payment. I got off the laptop at 10:25AM and ate 15 Oreo cookies (1/3 of the package I brought from the US) - cheaper than airport food! Back inside the airport I spotted this attempt at art/humor in a little used atrium area. When I looked at the departure flights I noticed a LAN flight to my destination that was to leave at 12:45, so, since I was getting bored I went to the LAN ticket sales counter and found out that the flight was not sold out. The girl was as baffled as I was as to why I wasn’t originally booked on that flight. So I got in line and got a seat on that flight. It left on time and got me to Copiapó at 2:05PM. Brilliant plan. But just one problem. 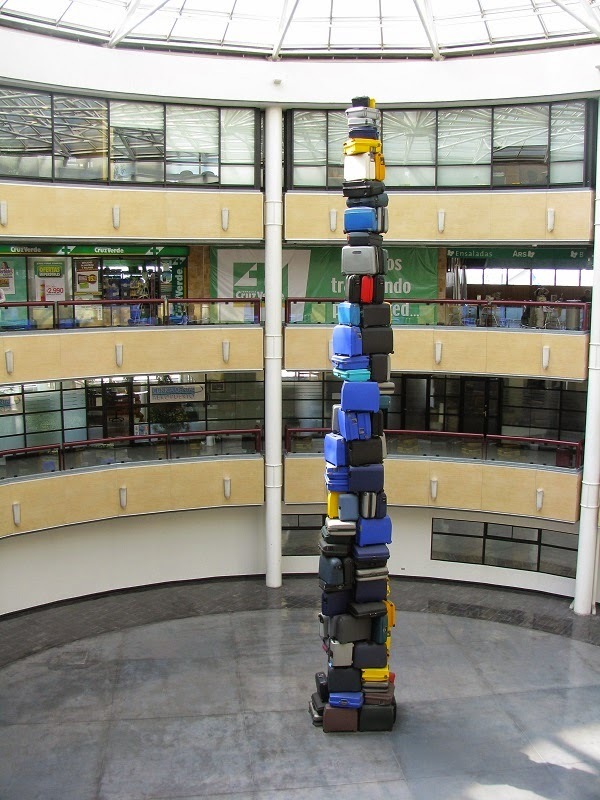 My luggage was booked on the later flight. Worse, the rental car that I had reserved wasn't even there yet. I mean the place only had a few rental cars, and I had reserved one to be ready this evening. It was still in the possession of the previous renter. Well, as it turned out this gave me an opportunity that entirely made my day. 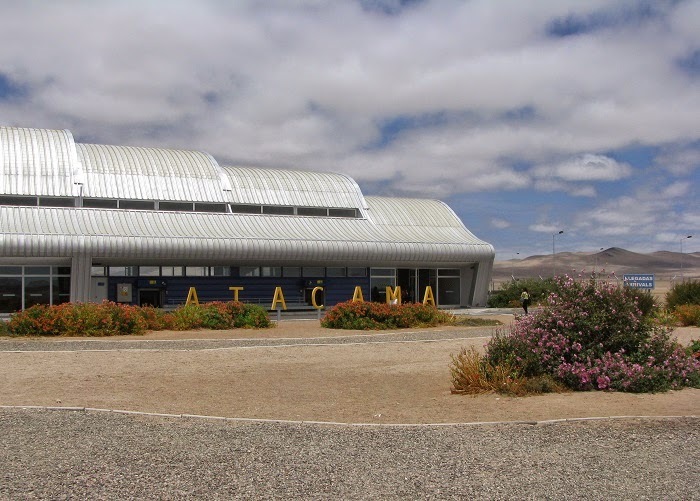 The little Atacama airport is a peaceful, isolated gem--nearly new, very quiet, with a flight arriving and departing every few hours at most. The LAN people were really nice--nobody at this airport was even remotely able to speak English, so my weak Spanish (took three years of it in high school back in the Stone Age) got a workout. LAN gave me a voucher for a free snack in the spacious, nearly deserted upstairs lounge, and I had 20 minutes of free internet during which I posted an update for family on Facebook. I would have paid for more access, but again I could discover no option to do so. Meanwhile the battery on the laptop was running down below 50% and there were no outlets. Along with my free snack in the lounge I bought a Chilean beer that was very tasty--first for my bottle collection. When the internet stopped working I caught up on journaling and downloaded all the new photos from my camera. Still a couple hours to kill. The desert was calling. Taking my suitcase with me I headed out eastward across the highway and into the completely desolate terrain. Along the entrance road to the airport is this bizarre 1000 foot long totally enigmatic (literally) iron I-beam sign with seven esoteric words on one side and seven more on the other. I hiked about a mile east across the lunar landscape to a little rise in the flat gravelly surface that was mostly free of vegetation. At the rise there were tiny bushes that looked dead and little cacti that were definitely alive with relatively new growth showing green. 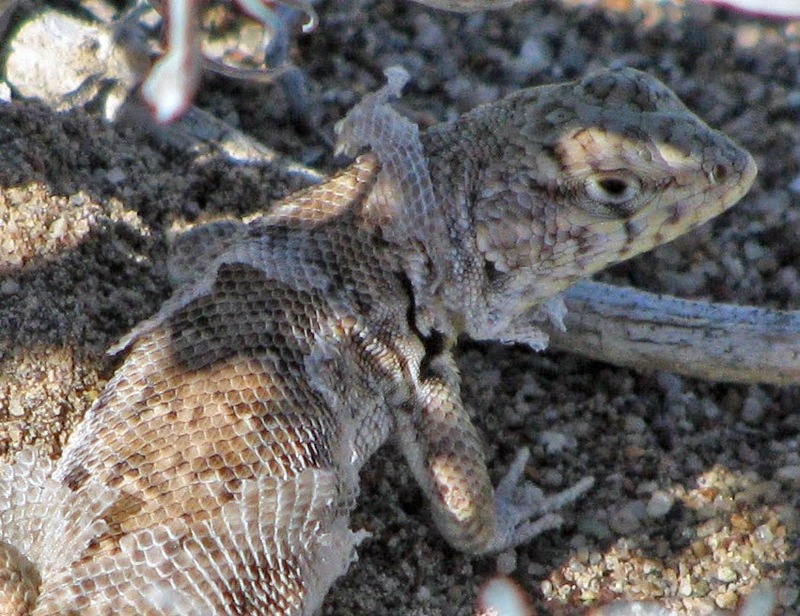 There I met this little lizard, still working on shedding a layer of old skin. And on the way back I took the photo that headlines this post. It's one of my all-time favorite shots (because I'm weird that way). It tells a story far grander than the true one. I think it would make a great 'caption this' opportunity. I got back to the airport around 6PM and waited around, changed back out of my trekking shoes (lucky to have them in my carry-on), drank the diet coke that I got from the restaurant as part of LAN’s free lunch voucher, and just hung out as the airport got busy with a couple of arriving and departing flights between 7 and 8PM. At 7:15 I checked with Avis and found my car ready--a nearly new Hyundai sub-compact hatchback called a Getz. I stowed my luggage there and waited until the flight with my luggage arrived at 8PM. Finally I was on the move again. It was about a 30 mile drive to the Rocas de Bahia Hotel in Bahia Inglesia right on the Pacific Ocean. I had to circle the little town once before getting to the Hotel entrance because the oceanfront street--quite a little tourist strip--was one way. Finally I checked in as dusk was settling. After 36 straight hours without sleep I was running on adrenaline, but I wasn't ready to crash yet. I unpacked, set up my laptop to begin recharging with the Bolivia-bought converter, which thankfully works in Chile, and then inquired about internet access after finding none in my room. They had a hot spot in the lobby, one in the upstairs restaurant and one in a small lounge area sort of tucked between floors in the open stairway. I settled there and checked basic weather back home and sent out a third and final report for today to my Facebook friends. I took a shower and shaved and snacked. I had nothing to drink, though, and didn’t want to risk drinking the water, which was extremely hard and probably tasted bad even if it was safe. In my circuit of the tiny town I had passed a small grocery outlet so I drove back there and asked if they accepted US dollars or my Visa card. They couldn’t so I hurried back to the hotel lobby to find that they couldn’t change my money either, but that the restaurant upstairs had bottled water and could charge it to my room (thus to my credit card). So finally I had three half liter bottles of water and was set for the evening. I got back to my room about 11PM Chile time. I drank one water and settled on my bed and rolled over without turning off the room lights to see if I was ready to crash and burn or just smolder and fade out. It was the last thing I remembered.